Whatever your parking lot is made of, we can sweep it clean, and keep it clean! Whether your parking lot is adjacent to an office or business, or a central parking lot designed to generate revenue, keeping it clean and neat is essential. An unkempt parking lot is not only unsightly; it discourages people from parking there. But a neat, clean, well-kept lot is like a welcome mat set out in front of the entrance, beckoning people to utilize your services or shop in your business. 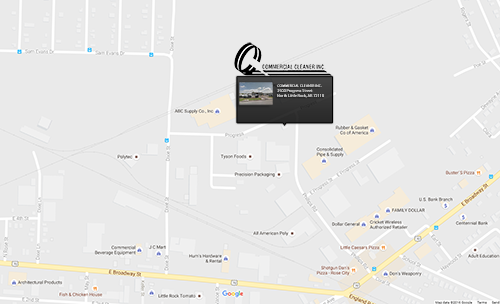 At C & C Commercial Cleaner, Inc., parking lot services are our business, not a sideline or a second job. We deploy a dozen GPS controlled parking lot sweepers to maintain over 200 parking lots in Central Arkansas, and in 30 years of business, our commitment to our customers has fueled our growth into the largest parking lot sweeping company in Arkansas. Our team of professionals is on call 24/7, and our fleet is fully licensed and insured. Concrete and asphalt are both durable materials, requiring only occasional maintenance, but keeping them clean and looking sharp requires a regular cleaning schedule. We will work within your schedule and your budget to provide you with the best service possible, and if you need a cleaning between scheduled service calls, our trucks are always a phone call away. A member of our management team inspects the parking lots we are responsible for to ensure top quality service for our clients, and if you ever have an issue, let us know and we will take care of it promptly. At C & C, our service is what we sell, so we go all out to make sure our service is the best available. Contact us online or call us at (501) 945-3219, and we’ll be glad to make you our next happy customer with one of the cleanest parking lots in town.